When I first saw the trailer for Typoman: Revised the first thing that stuck out to me was the game’s emphasis on words. For those of you who haven’t seen the trailer, you play as a hero built out of letters. The main mechanic in the game involves using the letters scattered around the environment to create words. The words you form will impact the game’s environment which you use to solve the game’s puzzles. For example to turn on a switch you will have to use letters to form the word “on”. When I first saw this mechanic I was impressed since I thought it was a clever idea for a puzzle platformer. I have never seen another puzzle platformer use a similar mechanic either. After playing the game, the word mechanic didn’t disappoint. While the mechanic is pretty simple, it works really well. A lot of the puzzles are pretty easy but it is still satisfying solving the puzzles in the game. You would think a word puzzle mechanic stuffed into a puzzle platformer would really stick out. Typoman: Revised does a really good job blending this mechanic into the gameplay and the environment though. While most of the game utilizes this basic word mechanic, later in the game an additional mechanic is added which mixes things up and adds a little complexity. The game eventually adds a mechanic where the words you form are transformed into words with the opposite meaning. You use this mechanic to turn bad/dangerous words into good words or good words into bad/dangerous words. This mechanic is mostly used to stop hazards but you occasionally use it to get access to letters that you would otherwise not being able to use. I really liked this mechanic but wish it was introduced a little earlier in the game so it could have been used more. The game’s word mechanic also has some interesting side effects. While most of the puzzles seem to only have one solution, there are some puzzles where you can use a couple different words/approaches to solve them. While I don’t think this is enough to go back and play the game again, it is always nice when games give multiple options. Typoman: Revised also has some “Easter Egg” words which when created impact the environment in some funny ways. Funny hats can be added to to your character and there are several hidden events. While these don’t really add anything to the gameplay they are nice little Easter Eggs to stumble upon while playing the game. While I classified Typoman: Revised as a puzzle platformer, the puzzle aspect of the game is much more prevalent than the platforming. There is nothing wrong with the platforming mechanics but there is nothing really new in this part of the game either. Most of the platforming is just jumping between platforms and is used mostly for breaks between the various puzzles. 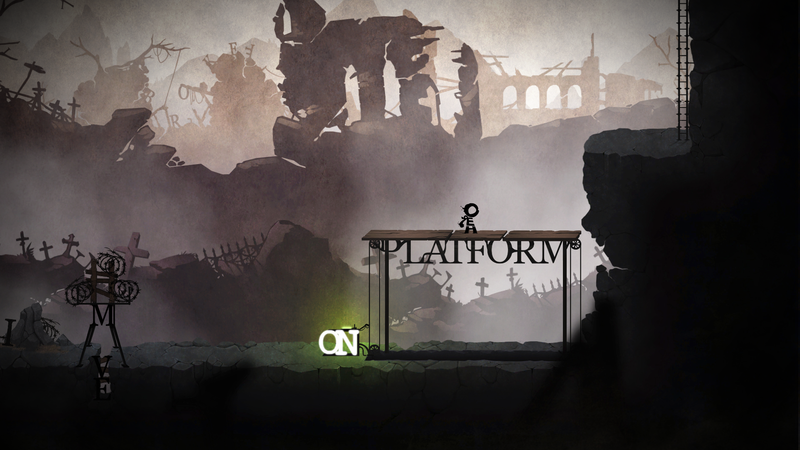 If you are more interested in the platforming than the puzzles, Typoman: Revised may not be the game for you. For the most part I would say the game’s presentation and story are really well done. When you first look at the game it will remind you a lot of games like Limbo and other platformers that use the same style. That comparison is warranted since the game seems to have taken a lot of inspiration from those type of indie games. That is not a bad thing since while the style may be similar, Typoman: Revised does a really good job utilizing it. While the game’s artwork might be considered minimalist, it is really well done. I especially liked how the game implemented the word concept into the game’s art style. As far as the story I will admit that I found the story to be a little abstract. The story is kind of dependent on what you make out of it since I think different people will interpret it in different ways. For spoiler reasons I am not going to really get into it, but I think it was pretty good. Your enjoyment of the story may be dependent on how you interpret it though. While I really enjoyed Typoman: Revised, it is not perfect. Probably the biggest complaint I have with Typoman: Revised is the length. Being an indie game I wasn’t expecting a really long experience but I wish it could have been a little longer since I really enjoyed the game but it came to an end too quickly. Without going for all of the achievements or trying to form as many words as possible, I would expect the main game to take most people 2.5-4 hours. The game also includes two mini games. One of the games gives you a group of letters and you try to form as many different words as you can in a given amount of time. The other mini game utilizes the opposite word mechanic where you need to use opposite words to get some of the letters you need to form a target word. These two mini games are decent distractions but I don’t see people getting a lot of time out of them unless they are big fans of word games. If that describes you though I could see you enjoying these two mini games quite a bit. The second biggest complaint I had with Typoman: Revised is that the game’s word choice can be a little picky at times. There are situations in the game where you will come up with a word that should solve the current puzzle but it was not one of the chosen words for that situation. For most of the game this wasn’t really an issue for me but it was an issue with a puzzle later in the game. I forgot one of the “trigger” words that activates a part of the environment and ended up forming several other words that could have worked but weren’t the right word so I was stuck until I remembered the word that activated that part of the environment. While it wasn’t a prevalent problem for me, I could see it becoming quite frustrating if you regularly run into these situations. If you want to avoid these situations you may want to consider writing down the trigger words as you encounter them throughout the game so you don’t risk forgetting the correct word to use later in the game. My final complaint with the game is a little nitpicky. For the most part the controls work well. I really didn’t have any trouble with the movement or jumping controls. The game does have the occasional issue while manipulating the letters though. I wish it would have been a little easier to manipulate the positioning of the letters even though you get used to it the longer you play the game. I really enjoyed my time with Typoman: Revised but I will also admit that the game will not be for everyone. I thought using words/spelling as a puzzle solving mechanic was clever and was used well to create some good puzzles. The game’s atmosphere was also really well done. Typoman: Revised is on the short side though and could become frustrating if you can’t figure out the exact word needed to solve a puzzle. If you really like the idea of using words as a puzzle mechanic, I think you will really like Typoman: Revised. If the length bothers you though you may want to wait for a sale on the game. If the word puzzle mechanic doesn’t really appeal to you though or you are looking for more of a platformer than a puzzle game I don’t think Typoman: Revised is going to be the game for you. We at Geeky Hobbies would like to thank Brainseed Factory for the review copy of Typoman: Revised used for this review. Other than receiving a free copy of the game to review, we at Geeky Hobbies received no other compensation for this review. A truly innovative mechanic for a puzzle platformer. Well designed puzzles and atmosphere. A short experience at only 2.5-4 hours. Can become frustrating if you can't find the exact word the designers chose for certain puzzles.